Exquisite onsens, the best of Japanese haute cuisine, historical artefacts and authentic luxury all around – Nishimuraya Honkan ryokan in Kinosaki Onsen, Japan’s Best Hot Spring Resort Town, takes indulgence to a whole new level. Dubbed “Best Onsen Ryokan” by Lonely Planet, the luxury ryokan, now in its seventh generation, is not only the ultimate hot spring inn experience to be had when visiting Kinosaki Onsen but also offers travellers the unique opportunity to experience the most traditional type of Japanese accommodation, the ryokan, in its most luxurious form. Nishimuraya Honkan is designed in a unique maze-like layout lending a generous sense of privacy. 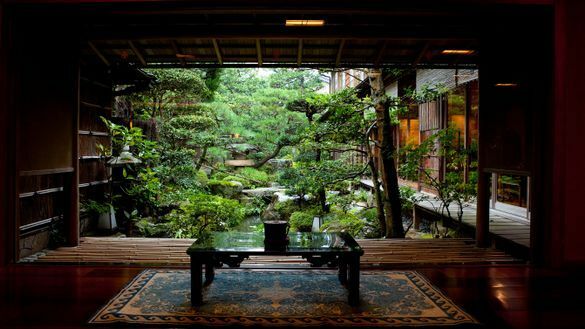 From its authentic Japanese rooms with tatami mat floors, wooden terraces with spectacular garden views, to being home to two superb onsen baths and an extraordinary private gallery of art and historical artefacts, authentic finesse and sophistication can be felt throughout the whole ryokan. Culinary indulgence is offered by the ryokan serving seasonal kaiseki (Japanese haute cuisine), with signature specialties including Matsuba crab (winter only) and Tajima Beef, using nothing but the freshest of produce. Many of the guest rooms of Nishimuraya Honkan look out onto a peaceful and lush Japanese garden, where Japanese pines and other ornate greenery shadows the moss-covered statues and koi fish pond. The ryokan appeal in Kinosaki Onsen is a special one with the entire town built to replicate one big ryokan: the station being the entrance, the streets the hallways, the ryokans the guest rooms, and the hot springs the bath. “Staying in a ryokan is a one-of-a-kind experience, one that gives you the unique opportunity to get an insight into Japan’s culture and traditions whilst delving deep into its indulging pleasures such as its onsens and delicious food” said Alison Roberts-Brown, former long-term Japan resident and Director of Tourism Garden, representative of Visit Kinosaki in Australia. Visit Kinosaki Ryokan Listing offers a wide range of ryokans to choose from with options for every budget all the way up to the ultimate luxury experience.